inicio Tags Mensajes etiquetados con "Carnaby Street"
Carnaby Street brings together, in some way, some of the most interesting contrasts to analyze a public space from a critical perspective: a versatile and complex environment in which multiple dimensions intersect, an urban landscape different from the rest of London and a powerful cultural background that, as a whole, give the neighborhood its own identity, Soho; together with the characteristic phenomena of the neoliberal city and often associated with emblematic areas of large cities such as gentrification, museification and touristification, which frontally deny the full right to the city. About 5 minutes walk are Regent’s Street and Oxford Street, the main shopping streets in the British capital, the latter being the one that “enjoys” the greatest influx of people and the hustle and bustle of urban activity. 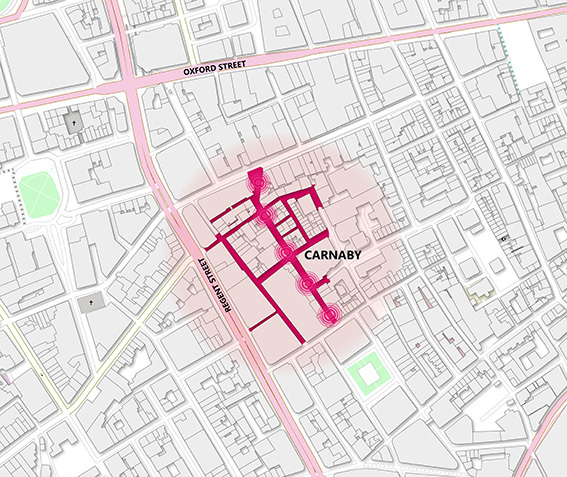 This contextualizes the importance of commercial uses in Carnaby, mainly retail and F&B. 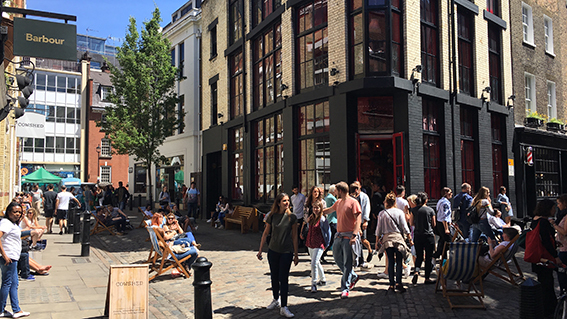 However, while the two large avenues host international brands, Carnaby has historically been an area of independent establishments that have fostered an active and diverse use of public space, building an undeniable cultural, commercial and tourist experience over the years, as well as an identity of its own. In this sense, the area has become a world benchmark. 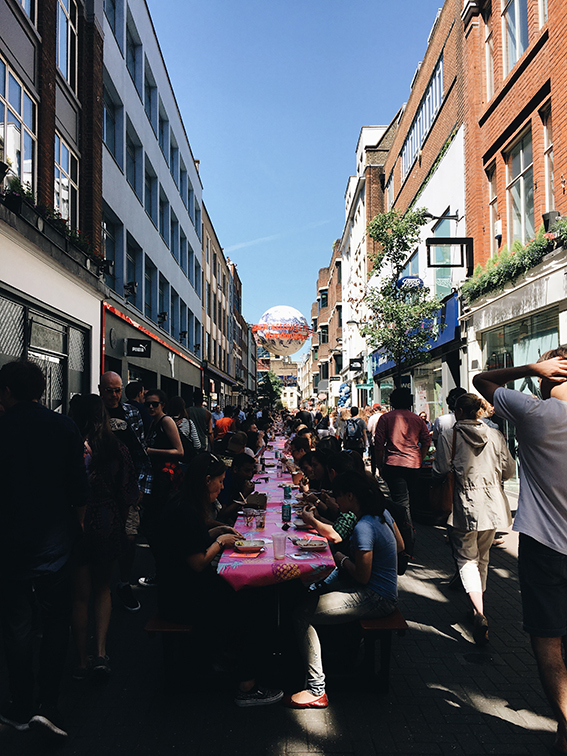 In this way, the intensive use of public space in Carnaby is due to the influx of visitors who travel daily and the high number of activities that take place. 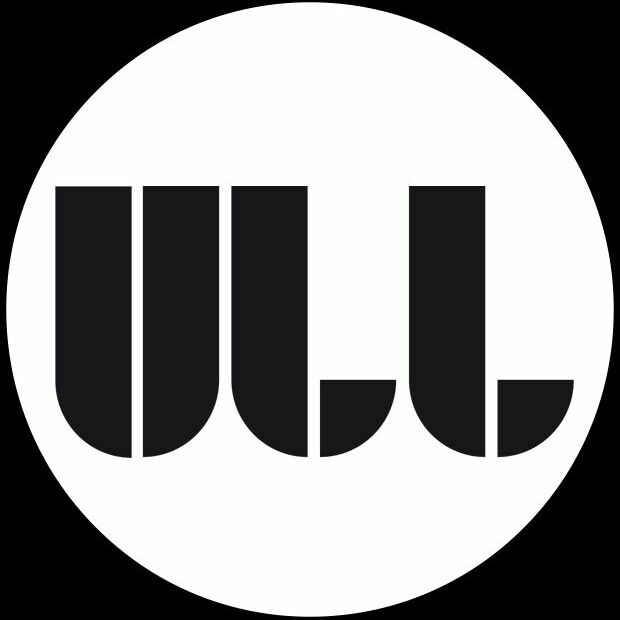 To describe the space through the experience of uses (passing through, standing, sitting, occasional and necessary interactions, etc.) we rely on the questions that Jan Gehl raises in his book How to study public life: how many people, who, where, when, what and how long, and on the diagrams below. As previously noted, the narrow streets of Carnaby receive a great affluence of people which number can become enormous at specific times. During the weekday, it is mainly the local residents, workers, delivery people and consumers who navigate the streets, generally passing through. It is also the preferred time for those who like to walk around the area quietly, older people above all. However, after the workday and especially when the weather is fine, the streets of Carnaby become a hive of people among whom we can distinguish those who choose it as a passing zone due to the diverse experiences it brings; people who meet with booze on the terraces of bars and pubs, as a gathering place; a much higher number of people who go shopping; and the most unusual and bizarre characters who, curiously, tend to roam the area in the evenings and end up in a nightclub. 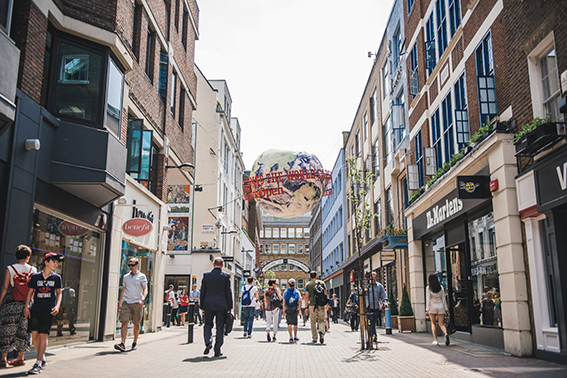 During the weekends and especially in festive and summer times, these numbers multiply together between local visitors and tourists, making Carnaby Street a main anchor. 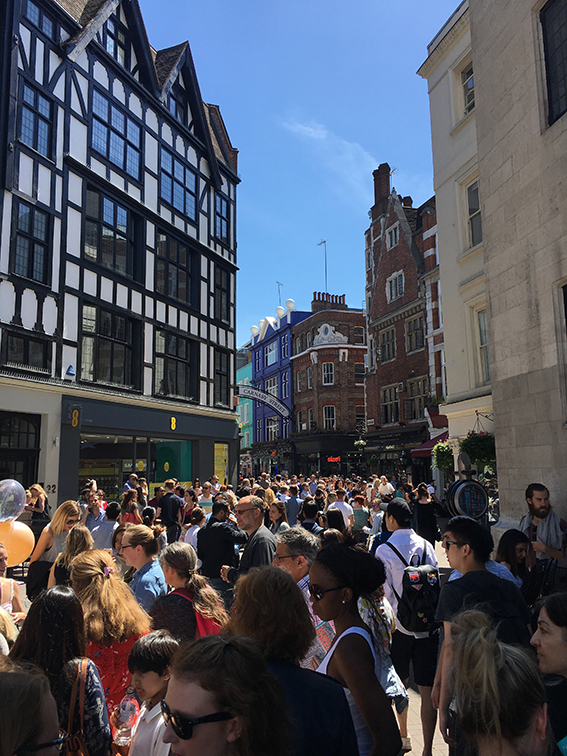 The level of overcrowding reached in the events scheduled every few weekends is such that, in some cases and unfortunately, it causes Carnaby to be an area to avoid. Thus, it might seem that we are facing a living and diverse public space in which the great influx of people is the price to pay for having a quality urban landscape with a wide programmatic diversity. However, what superficially seems positive, it is not so much as we dig a little deeper. The high civic potential that Carnaby morphologically possesses as it is an area of centrality, with great accessibility (it is permeable from two main streets, pedestrian and without different levels in street section) and with ad-hoc space-time configurations during the events that take place, it is not used due to a spatial configuration that does not invite to stay beyond these events. The number of benches (close to zero) contrasts with the number of terraces where you have to consume to sit. The number of trees is also very low and, in any case, they are not designed to provide shelter and generate resting areas. It is an area conceived by and for consumption, either by passing (shops) or permanence (bars, pubs and restaurants). Urbs is denied while unforeseen uses hardly have a place. It could give the sensation that during the programmed events new ways of use of the public space proliferate, but to speak of unforeseen uses and of previously programmed events, in this and in most of the cases, is an oxymoron. In this sense, it is difficult to build unexpected stories through unexpected relationships that encourage serendipity; everything is previously determined under an established order (polis) that denies, as mentioned at the beginning, the right to the city to its full extent. There is also an absence of political potential despite attempts to disguise marketing campaigns in forms of protest. In Carnaby we find thematization, not manifestation. 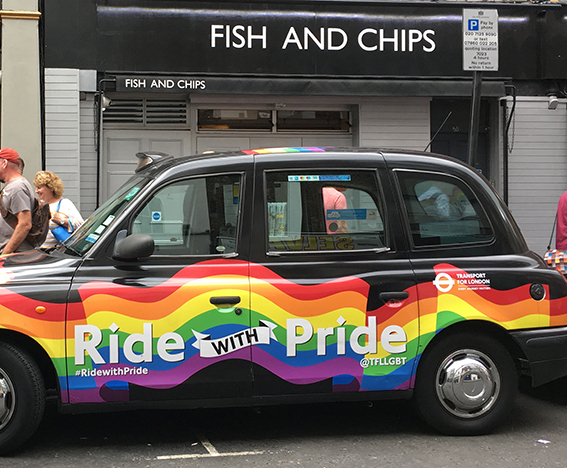 Let’s use the example of the World Pride Day (or weeks, commercially speaking) to argue this position. Historically, Soho has been a center of reference for the struggle for sexual equality, and still in many of its corners independent claims can be seen: messages, flags -throughout the year-, books, cultural events; Carnaby Street, however, disguises itself these days in an agglomeration of messages, colours and hashtags inviting people to interact, take photos… and consume because of the LGTBI struggle, which took place in the streets in the 1980s but today does on Twitter and Facebook. We are impassive to the substitution of the public, political and ideological space for the construction of a hollow speech with profit-making final purpose. The maximum exponent arrives in Christmas times; the values ​​that Christmas supposedly gathers in terms of family relationship and friendship, kindness, reunion, etc. they vanish among the play of lights (literally) that indicate different ways of consumption. 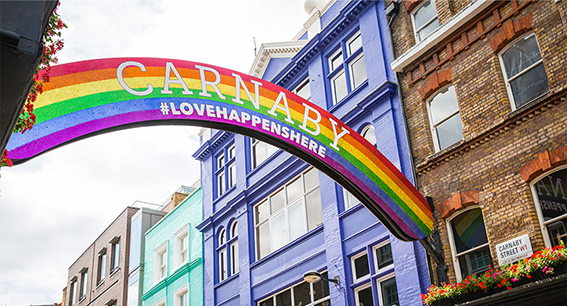 The header of the Carnaby website summarizes well the above: “13 streets in the heart of London’s West End with over 100 shops and 60 restaurants, bars and cafes”. When the proposal for the use of urban space is only linked to consumption, behaviours are restricted and relationships are limited. It leads to forms of homogenization of the urban landscape, in the reification of a public space converted into a museum object when, in reality, its identity has been forged by its subjects along spatio-temporal aggregations. These subjects, the different collectives and groups of people, the urban tribes that constitute the public space and that are not represented in the hegemonic vision of urbanism, are denied in the neoliberal city. In the end, there is the feeling that the aesthetic and symbolic value that identity traits provide turns against the local inhabitants for attracting the most perverse practices of (not) making a city. It is what Schumpeter called “dying of success” when he predicted the sociopolitical disintegration of capitalism and that Mariela Iglesias accurately points out about the neoliberal city: “The slavery of mortgages ruining lives, the touristification of the emblematic stealing senses, precarisation kidnapping the future, gentrification expelling us. The dying of success of a city before my / our eyes “. In short, what would be a great opportunity to generate a true social ethos, the great civic and political potential that Carnaby has and the quality of its urban landscape, are at risk of becoming (already happening) a parody of themselves. Once again, the history of our cities is repeated: reification of the public space, thematization of the urban landscape and museification of the city. (1). It is worth mentioning an anecdote that occurred to me one morning that I went out to observe the area and the behavior of people during working hours. An old woman saw me taking pictures and asked me, sympathetically, what the street looked like. In an attempt of provocation I told him that it was my favorite area of London, to which he replied shaking his head: “you say that because you are not from here but it is the worst, this is not what it was years ago”. Borja, Jordi (2013). Revolución Urbana y Derechos Ciudadanos. Madrid. Alianza Editorial. Gehl, Jan (2014 ). Ciudades para la gente. Ciudad Autónoma de Buenos Aires: Infinito. Traducción de Juan Décima. 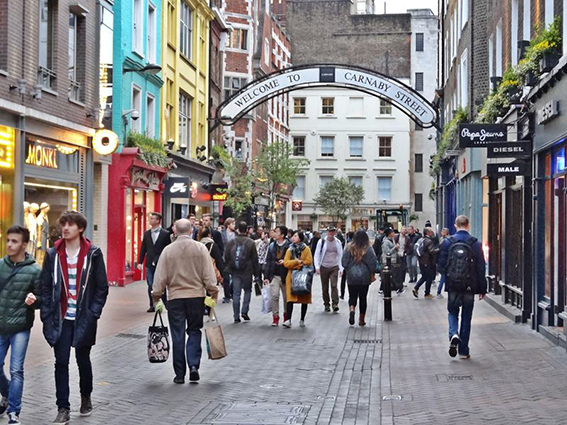 Carnaby Street reúne, de alguna manera, algunos de los contrastes más interesantes para analizar un espacio público desde un enfoque crítico: un entorno versátil y complejo en el que se entrecruzan múltiples dimensiones, un paisaje urbano diferente al resto de Londres y un trasfondo cultural potente que, en su conjunto, otorgan identidad propia al barrio, Soho; junto a los fenómenos característicos de la ciudad neoliberal y con frecuencia asociados a áreas emblemáticas de grandes urbes como la gentrificación, museificación y turistificación, los cuales niegan frontalmente el derecho pleno a la ciudad. Carnaby Street es un conjunto de calles peatonales y comerciales en el Soho, situado en el área central de Londres (City of Westminster). Aunque es una calle en sí misma, sólo se puede entender el impacto que genera en conjunto y relación con sus colindantes, conformando el área de Carnaby: Beak Street, Broadwick Street, Kingly Court, Ganton Street, Marlborough Court, Lowndes Court, Fouberts Place, Little Marlborough Street y Great Marlborough Street. Su background cultural se refleja en el hecho de ser uno de los máximos exponentes del movimiento Swinging London: estilo Mod y Hippie en los años 60, movimiento Pop de los 80, epicentro del movimiento LGTBI, espacio público como lienzo de diversas obras de arte urbano, etc. 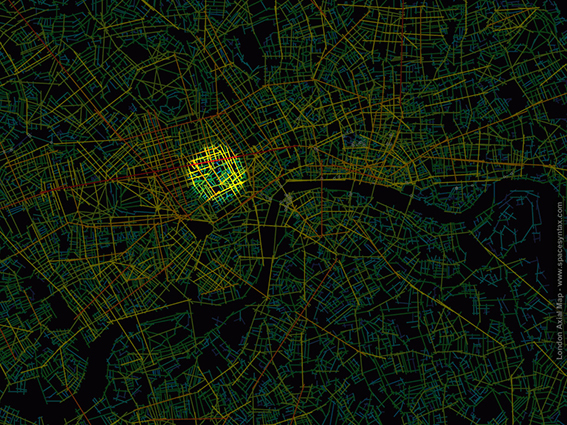 A una distancia de unos 5 minutos andando se encuentran Regent’s Street y Oxford Street, las calles comerciales más importantes de la capital británica, siendo ésta última la que “goza” de mayor afluencia de gente y de unos ritmos frenéticos. Esto contextualiza la importancia de los usos comerciales en Carnaby, principalmente en retail y hostelería. Sin embargo, mientras que las dos avenidas alojan marcas internacionales, Carnaby ha sido históricamente zona de locales independientes que han propiciado un uso activo y diverso del espacio público construyendo, a lo largo de los años, una imagen y experiencia cultural, comercial y turística indiscutible, así como una identidad propia. En este sentido, se ha convertido en un área de referencia mundial. 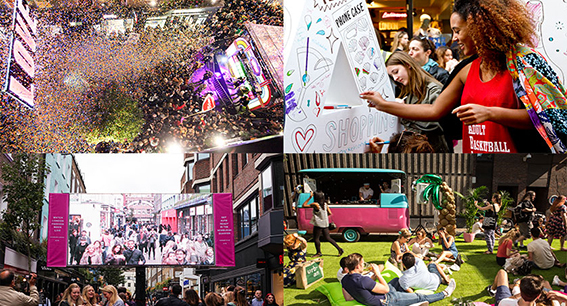 De esta manera, el uso intensivo del espacio público en Carnaby se debe a la afluencia de visitantes que lo recorren diariamente y al elevado número de actividades que se desarrollan. Para describir el espacio a través de la experiencia de usos (de paso, permanencia de pie, permanencia sentado, entrecruzamientos eventuales y necesarios, etc.) nos apoyaremos en las preguntas que Jan Gehl plantea en su libro How to study public life: cuánta gente, quién, dónde, cuándo, qué y cuánto tiempo, y en los diagramas dispuestos abajo. Como se exponía, las estrechas calles de Carnaby reciben una gran afluencia de gente que puede llegar a ser ingente en horas puntuales. Durante el día entre semana son principalmente los residentes locales, trabajadores, repartidores y consumidores quienes transitan las calles, generalmente de paso. Es también el momento preferido para quienes gustan pasear por la zona tranquilamente, principalmente gente mayor1. Sin embargo, tras la jornada laboral y especialmente cuando hace buen tiempo, las calles de Carnaby se convierten en un hervidero de gente entre la que podemos distinguir quienes la eligen como zona de paso por la experiencia distinta que aporta; quienes se reúnen con bebida en las terrazas de los bares y pubs, como lugar de encuentro; un número mucho más elevado de gente que va de tiendas; y los personajes más singulares y estrambóticos que, curiosamente, suelen merodear la zona por la tarde-noche para acabar en algún local nocturno. Durante el fin de semana y especialmente en épocas festivas y veraniegas, estos números se multiplican entre visitantes locales y turistas y convierten Carnaby Street en un centro de masas. El nivel de masificación alcanzado en los eventos programados cada pocos fines de semana es tal que, en muchos casos, provocan que Carnaby sea una zona a evitar. Así pues, podría parecer que nos encontramos ante un espacio público vivo y diverso en el que la gran afluencia de gente es el peaje a pagar por tener un paisaje urbano de calidad con una diversidad programática amplia. Sin embargo, lo que superficialmente parece positivo, no lo es tanto en cuanto profundizamos un poco. 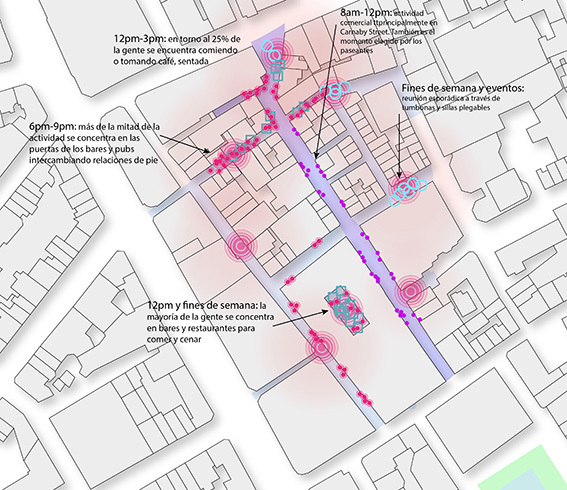 El gran potencial cívico que Carnaby posee morfológicamente por tratarse de un área de centralidad, con gran accesibilidad (desde dos calles principales, es peatonal y sin bordillos) y con configuraciones espacio-temporales ad-hoc durante los eventos que se celebran, no se aprovecha debido a una configuración espacial que no invita a permanecer más allá de estos eventos. Contrasta, por ejemplo, el número de bancos (casi nulo) por el número de terrazas en las que hay que consumir para sentarse. El número de árboles es también muy bajo y, en cualquier caso, no están pensados para dar cobijo y generar zonas de descanso. Es un área pensada por y para el consumo, ya sea de paso (tiendas) o de permanencia (bares, pubs y restaurantes). Se niega la urbs en tanto que los usos imprevistos difícilmente tienen cabida. Podría dar la sensación de que durante los eventos programados proliferan nuevas formas de uso del espacio público, pero hablar de usos imprevistos y de eventos programados previamente, en este y en la mayor parte de los casos, es un oxímoron. En este sentido, es difícil construir relatos inesperados a través de relaciones inesperadas que favorezcan la serendipia; todo está previamente determinado bajo un orden establecido (polis) que niega, como se mencionaba al principio, el derecho a la ciudad. Cuando la propuesta de uso del espacio urbano queda únicamente vinculada al consumo, se restringen los comportamientos y se limitan las relaciones. Desemboca en formas de homogeneización del paisaje urbano, en la cosificación de un espacio público convertido en objeto de museo cuando, en realidad, su identidad ha sido forjada por sus sujetos a lo largo de agregaciones espacio-temporales. Estos sujetos, los distintos colectivos y grupos de personas, las tribus urbanitas que constituyen el espacio público y que no están representadas en la visión hegemónica del urbanismo, son negadas en la ciudad neoliberal. Al final, queda la sensación de que el valor estético y simbólico4 que aportan los rasgos identitarios se vuelve en contra de los habitantes locales por atraer a las prácticas más perversas de (no)hacer ciudad. Es lo que Schumpeter denominaba “morir de éxito” cuando predecía la desintegración sociopolítica del capitalismo5 y que Mariela Iglesias señala con precisión sobre la ciudad neoliberal: “La esclavitud de las hipotecas arruinando vidas, la turistificación de lo emblemático robando sentidos, la precarización secuestrando futuro, la gentrificación expulsándonos. El morir de éxito de una ciudad ante mis/nuestros ojos”. En definitiva, lo que sería una gran oportunidad de generar un verdadero ethos social6, el gran potencial cívico y político que tiene Carnaby y la calidad de su paisaje urbano, corren el riesgo de convertirse (ya está pasando) en una parodia de sí mismos. Una vez más, la historia de nuestras ciudades se repite: cosificación del espacio público, tematización del paisaje urbano y museificación de la ciudad. (1). Cabe mencionar una anécdota que me ocurrió una mañana que salí a observar la zona y los comportamientos de la gente en horario laboral. Una anciana me vio haciendo fotos y me preguntó, simpáticamente, qué me parecía la calle. En un intento de provocación le dije que era mi zona preferida de Londres, a lo que contestó negando con la cabeza: “eso lo dices porque no eres de aquí pero es la peor, esto ya no es lo que era hace años”.